We know you'll agree that teeth are important! Our teeth serve our health needs by giving us the ability to chew our food to aid in the digestive process. And our smile is part of our personality! At East Alabama Family Dentistry, we always want our patients to have healthy smiles that they can feel good about, inside and out. Each tooth has a role; front (anterior) teeth are for biting and back (posterior) teeth are for tearing and grinding food. Our teeth work together in harmony to keep the jawbone healthy and maintain the proper distribution of pressure when you bite together. If a tooth becomes damaged due to decay or an old restoration begins to break down, the function of the tooth is affected. Over time with continued wear and exposure to oral bacteria, compromised teeth can continue to deteriorate and may become painful. At East Alabama Family Dentistry, we believe that virtually all the 'worst case scenarios' in dentistry can be prevented with regular visits and conservative treatment at the earliest possible stage. During your regular preventive care visits to our Auburn dental office, our dentist and hygienists will perform a complete examination with necessary x-rays to help uncover potential problems. If any teeth are in need of restoration, we will provide you with treatment options to rebuild your bite to proper function. When tooth structure is damaged or decayed, a filling or crown may be necessary to protect the tooth or bite from further damage. 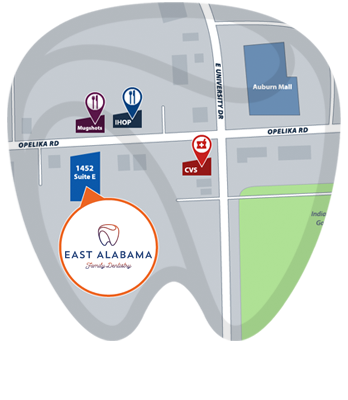 East Alabama Family Dentistry of Auburn uses CEREC® 1-Visit Crown technology to generate custom cosmetic crowns, bridges and implant crowns for placement in a single appointment. Fillings and crowns are recommended when tooth structure is damaged or decayed. A crown may be required if there is extensive loss of tooth enamel to protect the tooth from further damage. If decay or wear has undermined an existing filling or crown, it may require a new restoration. Root canals are necessary when the nerve of the tooth has become inflamed and infected. Following root canal treatment, a crown is usually recommended to prevent tooth fracture. Tooth replacement procedures, including dental implants, bridges, complete dentures or partial denturesreplace the lost function of missing teeth and help preserve bone health. Dr. Lucas has completed post-graduate training in the placement and restoration of dental implants. Dental implants can provide stability and support for replacement of missing teeth with dental implant crowns, bridges and implant dentures. Dr. Lucas surgically places the small implant cylinder in the jaw bone to function as an artificial tooth root. The dental implant is designed to behave as an anchor as the jaw bone grows around it, securing it firmly in place. This makes the dental implant the ideal restoration to serve as a foundation for a crown, bridge or denture. Auburn dentist, Dr. Thomas Lucas, provides consultations and restorative dentistry procedures in the comfort of his privately-owned dental practice. If you are not able to chew properly or are embarrassed about your smile, we can help! Contact East Alabama Family Dentistry to schedule an examination visit and let us help you restore your dental health.